Switzerland has numerous picture perfect villages that are perfect for you to spend some time at. Among them, Grindelwald is easily the best one when it comes to natural beauty along with the adventure that you crave for. Grindelwald is a pretty Swiss town blessed with amazing surroundings and is regarded as the ideal base to enjoy Switzerland’s natural beauty and charm. Also, the whole town is surrounded by majestic mountains from every side. While there are quite a few activities that you can do while you are here, visiting Grindelwald and exploring the slow paced town has its own beauty. In this article, we have you covered with the ​things to do in Grindelwald​ that will make your vacation a memorable one. Grindelwald is located centrally in the Jungfrau Region of Switzerland. You can either reach this beautiful ‘Glacial Village’ by air or road. Let us take a look at how to reach Grindelwald. By Air – ​The nearest airport to reach Grindelwald is Zurich-Kloten. From there, you can book a taxi or come down by train in 2.5-3 hours of time. Also, the EuroAirport in Basel-Mulhouse is 3 hours away from Grindelwald. By Train – ​While travelling from any place in Switzerland or any neighbouring country, you have to take international train connections at Interlaken-OST, where you will need to change the train. The BOB train from Interlaken-OST will take you to Grindelwald in around 35 minutes. By Car – ​If you are driving around Switzerland and wish to come to Grindelwald, take the Highway A6 or/and A8 to Interlaken, then take an exit to Wilderswil and follow the straight road to Grindelwald. While Grindelwald is a great place to visit throughout the year, it is during the summers you can explore it to the fullest. If you wish to explore the area fully in the pleasant weather then the summer months from April to June are the best to visit. Also, if you are someone who loves winters and extreme adventures, winter months from November to March are the best. This is the time when the whole area turns into a white wonderland. Also, it is during the winters, when you can experience the true culture of the town coming to life along with the adventure activities like Skiing, Trekking, Hiking, Cable Ropes and much more. Thus, depending upon what you are planning to do, Grindelwald is quite a great year around destination. Let us now take a look at some of the things to do in Grindelwald. ● Retail Therapy – ​While you are Grindelwald, there are quite a few shops around with different artifacts and things that you can buy. Also, there are a number of hotels, cafes, clothing and adventure stores for you. You can stroll around these to buy souvenirs or adventure stuff that you need while you are here. ● Mini Golf – ​While you are taking a stroll in the village, do not forget to visit the 18 hole mini golf course on the main road. You can play around the golf while watching the splendid views of the mountains and the famous Oberer Glacier. ● Mountain Activities -​ As beautiful as the town of Grindelwald is, the mountains that surround it is where the real fun starts. You can trek and hike up to the mountains if you wish to or take a cable car. Some of the most popular cable cars here are – one from Grindelwald to Schreckfeld and another one from Schreckfeld to First Summit. The views that you get upon reaching the First Summit are something you will cherish forever. ● First Flyer -​ Recently added to the attractions of Grindelwald, First Flyer is a flying fox that stretches downhill for 800 mts from First to Schreckfeld. The whole experience of coming down through a rope tied to you from height, while watching the beautiful mountains is something you should not miss. 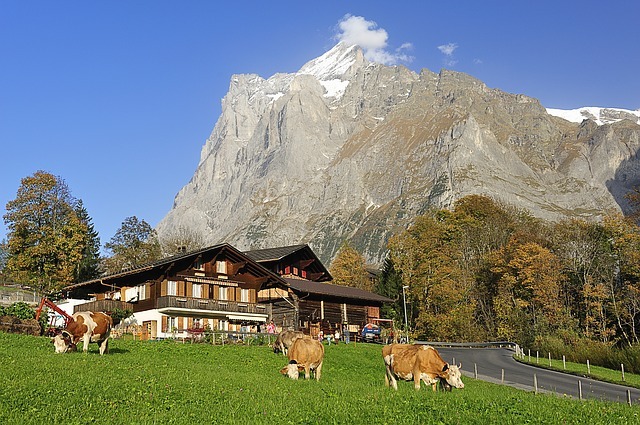 ● Hiking trails – ​There are numerous hiking trails in Grindelwald that you can go on. One of the most popular hiking trail is the 5.9 km round trip walk to the Lake Bachalpsee. If you happen to visit the lake on a sunny day, you will find the reflections of the beautiful Alps in the lake water. The climb is a bit steep at some points but apart from that, it’s a pretty doable for anyone. If you wish to go on a longer hike, you must do the one from First to Schynige Platte (via Bachalpsee) which is a pretty difficult 15 km trek. The trek is quite difficult but the views are quite rewarding if you manage to do it. ● Mountain Carts/ Trotti Bikes -​ Located at the depot of Schreckfeld, mountain carts are a great way to ride through the beautiful landscapes of Grindelwald. You can rent them and ride all the way down to the Bort through bumpy gravel and asphalt. The views on the way are quite rewarding while you can sit and ride the mountain cards. Also, the Trotti Bikes – a type of bicycle are also a great way to explore the town of Grindelwald and around. In the end, Grindelwald is all about the natural beauty that it has to offer, along with the numerous adventure activities, warm people and good food, Do not think any further, pack your bags, book your tickets and head out to Grindelwald to indulge yourself on an adventure like never before. And, if you want to plan a budget trip to Grindelwald and make the most of this beautiful Swiss village, you can go for the affordable packages by ​iTraveller​.